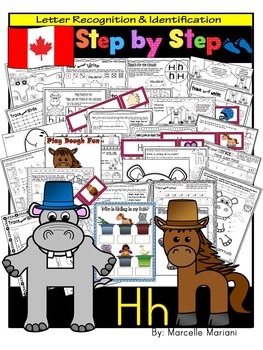 This 125+ pages BRITISH-CANADIAN-AUSTRALIAN SPELLING package contains tools and activities to teach the name and sound of letter H (Beginning consonant) and is suitable for Pre-KG, Kindergarten and Struggling grade 1 students (who need added support). The tools in all my packages are designed to teach students correct letter formation and identification using a guiding technique (arrows, dots and numbers). Most of the tools in this package and images used I created myself and the overall appeal of having custom made images adds great value to the overall quality of this work. 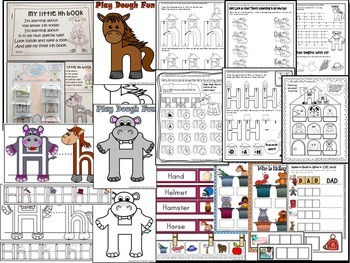 THIS IS A COMPLETE PACKAGE (Centers, worksheets, talking powerpoint, word wall cards, playdough mats, and art templates. Everything you need to teach and reinforce the letter H. This is the same format as with all of my other MEGA letter packs. PLEASE NOTE THAT THE PREVIEW FILE USED FOR THIS PACKAGE IS THE SAME AS THE ONE USED FOR THE U.S. SPELLING PACK. HOWEVER, THE WORKSHEETS IN HERE OFFER BRITISH SPELLING. THIS IS BECAUSE I AM USING THE SAME PREVIEW FILE FOR BOTH PACKS. THIS PACKAGE OFFERS BRITISH SPELLING WORKSHEETS- FOR A U.S. VERSION, PLEASE REFER TO MY STORE UNDER THE CATEGORY ‘LETTER PACKS’. These sheets can be used in class, as extra support, for homework or revision purposes. 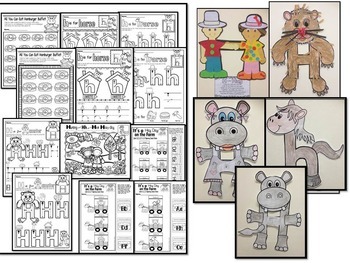 *Some of the tools used here take into assumption that children have already learned letters A, B, C, D, E, F and G so some of the worksheets reflect on letters A-G as well as H. Every package follows a sequence and will include items that include past letters in the alphabet sequence. BONUS: THIS PACKAGE CONTAINS ADDED TOOLS TO TEACH STUDENTS TO BLEND CVC WORDS USING THE SOUNDS THEY HAVE ALREADY LEARNED (a-h). 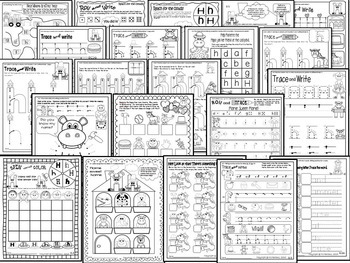 One set of worksheets focuses on proper penmanship and pencil control offering tracing bubble letters and larger print. The objective is to learn to properly print the letters and recognize vocabulary words and the letter. The second, geared for students who have gained pencil control, aim at teaching proper letter formation, sound and name recognition for letter Hh. NOTE: I do my best to strive for positive ratings. If there are any concerns with this product, PLEASE CONTACT ME FIRST AT MARCELLEMARIANI@GMAIL.COM. I will ensure that you are absolutely 100% satisfied with your purchase.